WORLD PEACE, ORGANIC FOOD, GLOBAL WARMING and STOPPING NUKE POWER come to Solartopia with two legendary guests: DENNIS KUCINICH and ARNIE GUNDERSEN. Likewise Arnie Gundersen, the legendary nuclear engineer who served as our lifeline to reality during the Fukushima catastrophe. A long-time insider to the nuclear industry, Gundersen came to realize its tragic shortcomings. He and his wife Maggie, also a veteran of the industry, have put their careers and lives on the line to deal with the true cost of this lethal industry. The Gundersen’s latest major report provides definitive proof that further investments in nuke power will not help the climate crisis, while further operations at the 99 remaining in the US are a threat to us all. An accomplished, compelling speaker, Arnie’s essential wisdom is a critical cog in the race to Solartopia. onald Trump’s demand for “monitors” at polling places to prevent a “rigged election” is an old and ugly story. It’s obviously aimed – KKK style – at stopping black and Hispanic citizens from voting. But in fact both major parties have used such terror tactics – and updated electronic ones – since the birth of the nation. The cure – we call it “the Ohio Plan” – is scorned by both corporate parties: universal automatic voter registration, transparent registration rolls that can be easily monitored, a national holiday for voting, and universal hand-counted paper ballots that stay in one place and are tallied (and re-tallied) in full public view. The “rigged election” story dates back to the Constitution. Its Electoral College gave a three-fifths “bonus” to slave-owners for blacks who could not actually vote. The race card carried through Jim Crow segregation and the KKK terror unleashed against post-Emancipation blacks who dared try to vote. It continues through the Drug War and the tens of millions of African-American and Hispanic citizens stripped of their freedom and franchise. Today it’s being done by computer programs that quietly eliminate millions of black and Hispanic voters from the registration rolls. In Florida 2000, Gov. Jeb Bush stripped some 90,000 mostly black and Hispanic citizens off the registration rolls in an election decided for his brother by 537 votes. In 2004, GOP operatives did it again to some 300,000 Ohioans in a state Bush won by 118,775. In moves that Trump should love, between the 2004 and 2008 elections, in a state with about 5.5 million eligible voters, 1.25 million Ohioans were de-registered. In 2012, the number purged was 1.1 million. So far this year, Republican secretary of state Jon Husted has de-registered over a million Ohio voters, more than 600,000 clearly eligible to vote and on the rolls of their county boards of elections. Photo ID, limited polling station access, machines that break down, provisional ballots that don’t get counted, absentee ballots that don’t get sent, elimination of days to vote, deliberate official misinformation and intimidation – all do exactly what Trump wants. They eliminate the “threat” of non-white voters. In reporting on Trump’s assertions, The New York Times quotes Ohio’s GOP secretary of state Husted as the “voice of reason.” But like other Republican secretaries of state across the U.S., Husted is aggressively stripping millions of black and Hispanic voters from the registration books. Nationwide, tens of millions of exactly the kinds of people Trump doesn’t want to vote will have been stripped off the voter rolls come November. Much of this is explained in Greg Palast’s new film, The Best Democracy Money Can Buy. As Michelle Alexander has explained in her book The New Jim Crow, tens of millions of blacks and Hispanics have been stripped of their votes since Richard Nixon declared the War on Drugs in 1971. Alongside filling history’s biggest gulag with about 2.2 million prisoners, America’s Drug War has anchored the GOP’s Southern Strategy by stripping blacks and Hispanics from the rolls in southern states where they comprise some 40% of the potential electorate. Neither Trump nor his mainstream critics mention mass incarceration’s “twin” means of election rigging: electronic voting machines. Some 80% of this year’s votes may be cast on touchscreen and other computerized devices that are absurdly easy to flip. The courts say the corporate-owned source code is proprietary. So there’s no meaningful accountability. Allegedly safe Scantron paper ballots are easily manipulated with corrupted tallying machines. Significant computer manipulations helped rig GOP presidential victories in Florida 2000 and Ohio 2004, and critical down-ballot elections elsewhere. These include the 2014 U.S. Senate races in North Carolina, Colorado, and Alaska that now loom large in terms of who might or might not be confirming new Supreme Court appointments. If we’re to have meaningful elections in the future, they must be conducted on paper ballots that are held at their precincts in transparent containers that do not move. Those ballots must be counted in public, by hand. Voter registration should be open automatically to all citizens, with registration rolls open to the public and easily monitored. Voting should be open to all on the basis of a signature. And we need a national holiday for voting so working people do not have to pay with their jobs for exercising their democratic rights. The “Ohio Plan” would also eliminate corporate money from our elections, end gerrymandering, and abolish the Electoral College. This coming election, up and down the ballot, could indeed be “rigged.” But it will happen exactly counter to what Trump says. Rather than eliminating millions of black and Hispanic voters, as he wants, we need to guarantee their franchise. We must be able to verify their presence on registration rolls. We need to make sure they have reasonable time and place to cast their ballots – free from KKK/Trump-style thugs intimidating us all. Above all, as they now do in Ireland, Switzerland, Germany, Romania, Japan and Canada, we need to cast our votes on paper ballots that are safety stored and counted by hand, preferably by our nation’s high school and college students, and our elders. Maybe then, Trump or otherwise, we can begin to think of America as a country where elections really aren’t rigged or stolen, stripped or flipped. Bob Fitrakis & Harvey Wasserman’s STRIP & FLIP SELECTION OF 2016: FIVE JIM CROWS & ELECTRONIC ELECTION THEFT has just been chosen as one of America’s most censored stories. It’s available at www.freepress.org, along with Bob’s FITRAKIS FILES. Harvey’s SOLARTOPIA! 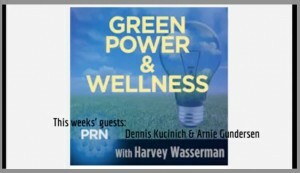 OUR GREEN-POWERED EARTH is at www.harveywasserman.com, along with AMERICA AT THE BRINK OF REBIRTH, available in 2017. Above is the video of Harvey Wasserman’s Saturday, September 24, 2016 presentation at the 2016 World Beyond War conference held in Washington, D.C.